CHICHESTER RFC have the top six in their sights as their mid-season surge up the table rolls on. 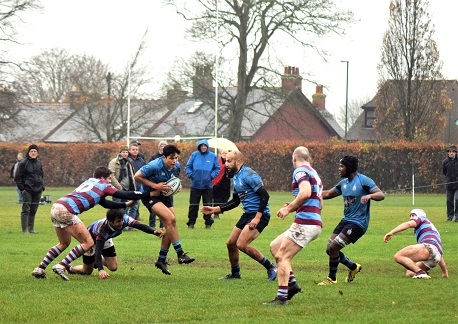 After a poor start to the London South One campaign, Blues have chalked up three victories on the spin. The latest was a 22-0 home win over bottom side Hove which has lifted Chi up to ninth in the table. With their early season issues with form well and truly behind them, Blues know that a victory at eighth-placed Cobham tomorrow (2pm) could see them leapfrog their hosts. If Chi bag a bonus point win and results go their way then they could end the weekend sitting in the top six of the London South One. It would be a remarkable turnaround for Scott Ashley’s side, who had won just one of their first eight matches of the campaign. With a number of influential players now returning to the ranks it looks as though Blues have turned the corner. The win against Hove was secured after a fast start from the hosts. Full back Charlie Norton managed to sneak in to touch down before kicking a fine conversion. 7-0 after 12 minutes. But despite having much of the better of the play, Blues were unable to add to the scoring before the break. Into the second period and an early penalty extended Chi’s lead. A drive from the pack looked to have extended the score but the officials disagreed. Instead, it took Sam Renwick to scythe through the Hove defence to extend the score to 17-0. Hove gallantly tried again but their backs lacked the tactical variety to penetrate. Blues capitalised. From lineout ball Chi backs pressed again and Rhys Thompson scored the third try right of the posts. Try as they did, Ashley’s side were not able to get the fourth score and bag the bonus point. –Bognor RFC return to Hampshire Premier action tomorrow when they welcome Eastleigh IIs to Hampshire Avenue (2pm). The Purple and Greens are currently third after winning seven of nine games.